I have a couple of good fixed voltage power supplies that I want to use one of them for a new track I am building. I also would like to dial the power back for my young daughter. Any suggestions of how I can add a voltage regulator so I can dial the power back for her. Any suggestions on what I can use? I've seen them wire in a dimmer switch for a light to reduce the voltage. It appears inexact but a Volt Meter would fix that. jhat, if you post the make and model number of the power supplies, I can help you figure out the best solution. You could use a light dimmer to reduce the line voltage to your power supply , however that can be dangerous. The transformer in the power supply wants to see a sine wave, but some dimmers have a pulsed or sawtooth output waveform that will cause a transformer to burn up. It might be better to use diodes to reduce the voltage output of the power supply. Each diode will drop 0.7 volts, wire as many in series as you need. If you want to get fancy you could connect diodes to a rotary switch. Or you could build this variable voltage regulator for about $14. You might save yourself a ton of trouble by buying a model railroad power supply and wiring it through a switch so you can power your track with the variable power supply or your fixed-voltage main power supply. You'd need to make sure the variable power supply can supply enough amps for however many cars would be on the track when your daughter is running (my guess, two). There are a number of such power supplies listed on eBay -- both new and used. Nothing wrong with used. If they work at all they should work fine. We run mostly Slot.it cars. Some with magnets and some without. Thanks for the model railroad power supply idea. I have one laying around and I will try this option when I get the track back together. Right now I have finished with most of the bench work and am starting on the scenery. I would recommend that you use the Revolectrix ms1228 power supply. A light dimmer won't have any affect, since it is a switch mode power supply. You could use the diode string that RichD suggested above. Or you could use a voltage regulator attached to the power supply output. This one https://www.amazon.com/DROK-Converte...onverter&psc=1 is a simple hookup and variable. the max voltage out of the regulator will be about 1.5 volts less than the power supply output voltage. And at $14 is an inexpensive easy solution. A model train transformer would work, but it would not be ideal because those are not usually regulated. I don't think that it would be a good idea to reduce the input voltage to a switch mode power supply. Putting diodes or a voltage regulator at the output side of either of your power supplies would be the way to go. The one that jhat suggested will do the job and as a bonus it has a display. The regulator in my article also will reduce your maximum voltage somewhat. My club runs non-magnet cars at 10 volts most of the time. One of the good fixed voltage power supplies you already have will probably do the job, try adding a cuircuit to reduce the voltage on one of those first before looking at new supplies. To reduce the voltage I'd recommend going with Rich's diode suggestion. That's cheap enough to have one on string of diodes for each lane so you can adjust the voltage separately - or you can just have one and reduce the voltage to all the lanes. As has been said, a dimmer switch may or may not work and may or may not cause damage - a lot more information would be needed to figure out if it would be OK. Unless you want to run much more powerful cars than your post suggests, you won't need anywhere near the 28 amps that has been recommended above. If you are using a power supply with more than a few amps, it would be wise to fit a fuse to each lane. Last edited by Al's slotracing; 01-03-2019, 09:31 AM. A long time ago I tried to reduce the input voltage to a DC power supply using a regular light dimmer and the transformer started to smoke almost immediately. If you had an oscilloscope you could make sure that the output of the dimmer was a sine wave. If you connected the dimmer to a lamp with a regular incandescent bulb if the output is a sawtooth the filament of the bulb will sing. If it was me I would not risk damaging a nice power supply. It is always a good idea to have a separate fuse or circuit breaker for each lane if there are going to be more than a couple of amps available. Most people probably do not know how much power their cars actually use. If you know the ohm rating of the car's armature and the track voltage you can calculate the maximum amp draw. Most modern inline HO cars, such as Tycos, Tomys and Life-Likes have a 6 ohm armature, at 18 volts those will draw 3 amps at start-up. At 12 volts that would be 2 amps. As soon as the motor starts to turn the amp draw will drop rapidly, cars of that sort will use 0.5 amps when they are still accelerating and 0.25 amps once they reach top speed. If you have a four lane track the cars would use between 1 and 12 amps at 18 volts. I recommend a minimum of 1 amp per lane. If a power supply is not regulated the voltage will vary as the amp draw varies. With a regulated power supply the voltage will be constant as long as the draw is below its rated value. If you exceed the rated value a fuse might blow or some protective circuit may kick in. Plenty of cheap DC motor speed controls on Ebay,you could easily add one to each lane. Said cheap DC speed controls might use a chopped waveform to simulate a lower voltage. If they do, they might not play well with an electronic controller. I have no evidence this is the case, but it is something I would want to check out before potentially putting an expensive electronic controller at risk. Also, they may not be voltage regulated -- voltage may change depending on the current draw (amps). A simple adjustable resistor (aka rheostat or potentiometer) won't confuse an electronic controller, but the voltage drop across the resistor will definitely vary depending on the current draw. Cars having armatures with different resistances will be affected differently. Cars that draw more amps will see a lower voltage. But if the idea is to be able to turn down the power so a kid can play, an adjustable resistor will work just fine, as long as it is rated for sufficient amps and can dissipate the heat. Tweak as required. The voltage drop of Rich's stack of diodes will NOT vary depending on current draw, or at least not very much. Nor will it upset an electronic controller. The only downside is you are limited to step-changes in the voltage drop due to the physics of the diodes you use. The diodes that Rich favors fixes that step-change at 0.7 volts per diode. 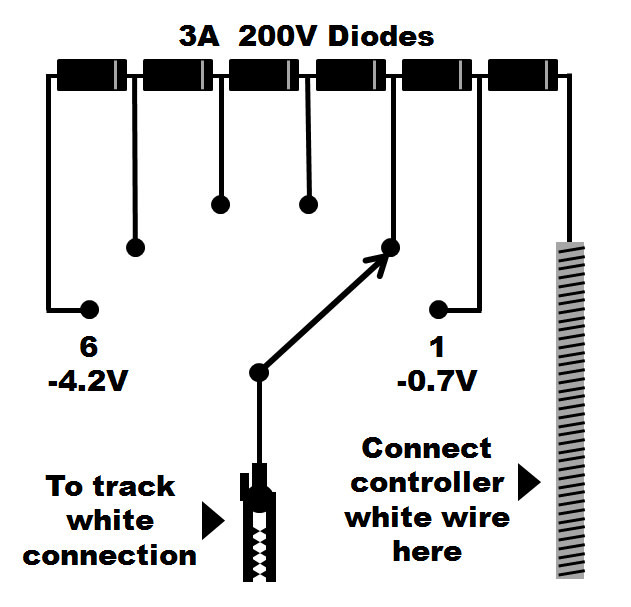 Those diodes need to be wired in series, and in the correct direction (polarity). Simple enough to do if you have any grasp of electronics at all. If not, study up on series circuits and diodes online. Google is your friend. Last edited by HO RacePro; 01-05-2019, 09:13 AM. Some voltage control devices use PWM (pulse width modulation), so the output would not be pure DC. The unit in the link is a regular voltage regulator. With a PWM device it might be a good idea to put a 2200µf capacitor across the output. One of these days I am going to write an article on power supplies for slot tracks. "Those diodes need to be wired in series, and in the correct direction (polarity). Simple enough to do if you have any grasp of electronics at all. "